People find this place rather nice! Average score: 5.4 by 1644 random voters. 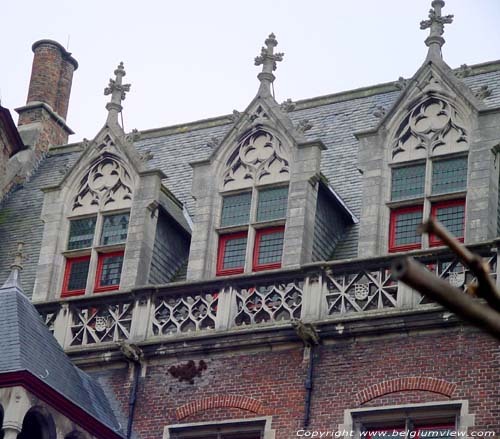 This gothic palace is one of Flanders largest remaining private houses of the Middle Ages. Is was the house of an important family that was originating from Bourgondy in France. Thanks to the fact that they ware the only ones owning the 'gruterights' (hence the name 'Gruut...'), which meant that they had the monopoly in handling dried fruits (added while brewing beer), they became very rich. The eldest aisle probably remains from 1425-1450. The windows in the pointed gable on the Reie are already put in a Brugian span, which makes this one of the eldest examples for this. The tympanums above the windows with cross bars contain trefoil tracery. The total of the 3 Brugian spans are included into a large trefoil tracery, again included in a pointed arch. The main aisle from 1450-1475 is even decorated wealthier. The nature stone dormers and breastwork refer to the Brugian Town Hall. In a tabernacle above the entrance, there is a statue of Louis of Gruuthuse, an important counsellor of Philips the Good. On the central plain you find a galery with 15th century stables. In 1628, this aisle was changed into the 'Mountain of Mercy'. In 1883, a restauration started with Delacenserie, which prepared the whole as a museum at which occasion neo-gothic elements were added. Although a lot of investigation precessed this renovation, it is wrong to think that the whole got it's original look back. Original is the interior of the pray chapel from 1472, which was directly connected to the choir of the Our-Ladies' church and allowed the family to follow the services from there. The tunnel vault is made of wood, and is supported by consoles in the shape of angel figures, between which you find the family saying 'Plus est en vous' (there is more in you).